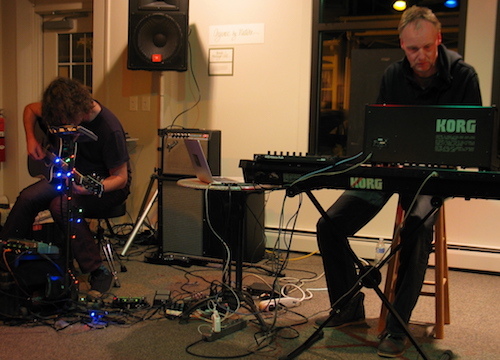 Here is the archive of Soundscapes Concert #21 featuring Bernhard Wöstheinrich and surprise guest Tim Motzer. 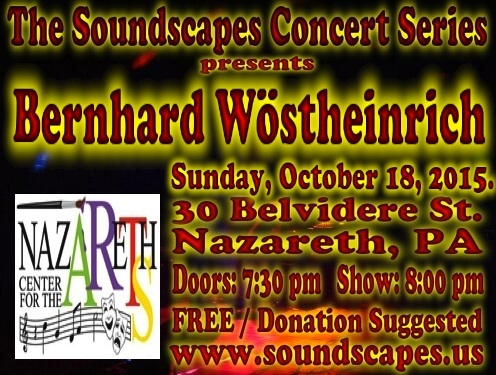 It took place at the Nazareth Center for the Arts on Sunday, October 18, 2015. 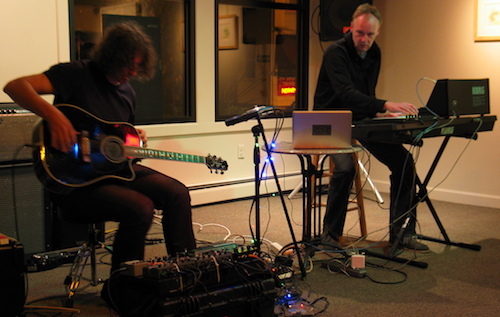 This was supposed to be a solo concert by Bernhard Wöstheinrich but he was joined by surprise guest Tim Motzer. Together, they previously played at SCS #18. The Facebook Event Listing and SCS Photos on Facebook have some photos taken during the event. BERNHARD WÖSTHEINRICH: Bernhard leads his own solo project "The Redundant Rocker" and his main collaborator is Markus Reuter (in CENTROZOON). He has also worked with Ian Boddy, Klaus Hoffmann-Hoock, No-Man singer Tim Bowness, Conrad Schnitzler (Cluster, Tangerine Dream), and Synapscape's Philipp Münch. Bernhard elicits meaning from abstraction in electronic music and painting. He has studied graphic design and has created an eclectic body of work in both graphics and music. Using a compositional approach akin to his work as a visual artist, Bernhard usually begins by improvising abstract sonic structures which are subsequently developed into an increasingly detailed aural picture. TIM MOTZER: Based in Philadelphia, this guitarist and composer finds infinite joy in diversity. His output as a leader and sideman crisscrosses multiple musical universes, including jazz, fusion, prog, hip-hop, soul, electronica, and the avantgarde. Motzer gets to explore these genres and the intersections between them via his ubiquitous presence in the wildly deep and varied Philly scene, where he can be found working with the likes of DJ/Producer King Britt, spoken word/hip-hop artist Ursula Rucker, and jazz-fusion bassist Jamaaladeen Tacuma. He also traverses manifold territories through the many albums released on his own 1k Recordings label, including the expansive, laidback song forms of Nucultures, the crunchy jazz-funk of Jazzheads, and the solo soundscapes of his Tilomo alias. Here is a short clip from the first set. Music ©2015 Wöstheinrich and Motzer. All rights reserved. Here is a short clip from the second set. Here is a little taste of how the evening went.